This weekend I am escaping from the rain and freezing temperatures of London, to take advantage of an incredible opportunity in Cambodia. I am going to be spending two weeks helping a young team of graphic designers, video editors and researchers explore how they could use infographics to explain things to their TV and online audiences. A few months ago I received an email from the BBC Media Action team in London asking lots of questions about how we produce infographics in the BBC News Visual Journalism team, and if I would be interested in helping the Loy9 project in Phnom Penh, Cambodia. I immediately jumped at the chance. 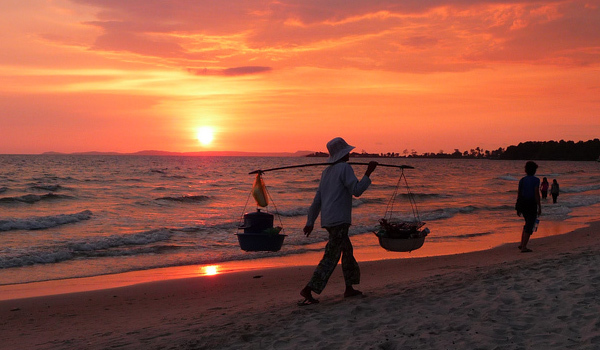 I spent a month in Cambodia when I was backpacking in 2008. I loved the country and the people I met there. This was an amazing opportunity to combine my passion for travel and infographics with the aim of helping others. Produce creative programmes in multi-media formats which inform and engage audiences around key development issues. In Cambodia, BBC Media Action have launched a new exciting civic education initiative with multiple media outputs. 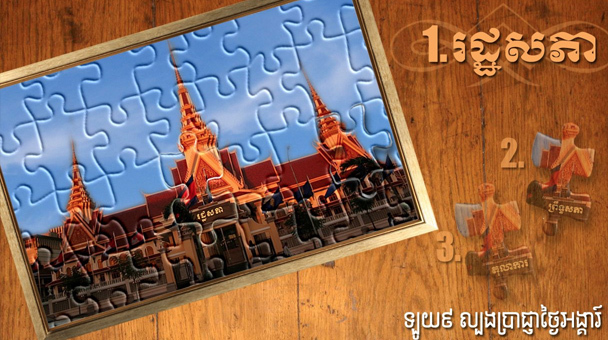 The aim of Loy 9 ( the Multimedia Initiative for Youth Civic Education) is to reach a large proportion of Cambodian’s rural and urban youth through mass media, providing civic education in a format that is engaging and entertaining. To engage young people (15–24) in governance issues (civic engagement) and identify solutions to their problems using the mass media. Strengthen young people’s understanding of democratic culture and encourage their participation in decision making processes. Raise awareness, through the media, of young people’s decision making capability. Use mass media to give a voice to young people. Leading the main thrust of Loy 9 is a 45 minute television magazine show. Aimed at a youth audience, it’s carried by a major broadcaster in a prime time slot. Through a variety of entertaining segments the show provides its Cambodian audience with information about civic life and opportunities for participation. 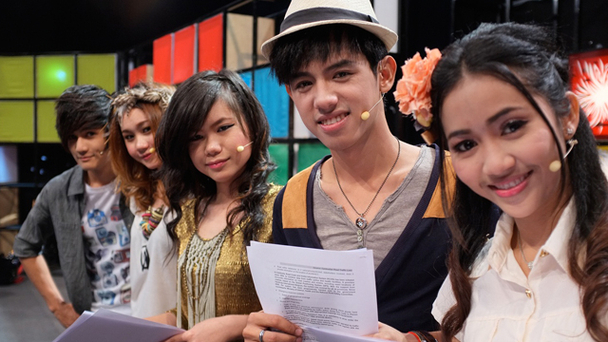 The show is presented by youth presenters and recorded in a studio in Phnom Penh. Regular segments include quizzes, competitions, debates and discussions, music and other entertainment. The design of the set, the pace, the style and the general ‘feel’ of the show is informed by careful user-testing and creates a sense of an entertaining place where it is safe to learn and participate. There is cross promotion between TV, radio, web, and print – thus encouraging audiences to use all of the components that are available to them. Within the show there is a drama series focused on a group of young people solving problems and finding ways to make their voices heard. The drama is a serial rather than a series, so each 10-15 minute episode makes sense even if the viewer has seen none of the previous episodes. But there is a story running through all the episodes and a climax at the end of each series of the magazine show. This will mean all the episodes can be repackaged to air on their own either on TV or as part of outreach activities such as mobile screenings, or potentially used in citizenship classes. They are now working towards Series 2 – to start broadcasting November 2012. Much of this will be shot in advance on locations around the country. There will be a considerable amount of audience participation and user-generated content. In April this year to mark the end of the first series of Loy 9, almost 1000 young people performed in perfect unison a line-dance called ‘The Madison’… and set a new Guinness World Record in the process. Cambodia is still recovering from many years of civil war and the brutal rule of the Khmer Rouge, under which an estimated 1.7 million people died. Many Cambodians who remember those days still believe that the safest policy is silence. Despite the fact that two in three people are under 30-years-old – the number of young people who vote in Cambodia is significantly lower than the average voter turnout. BBC Media Action research exposed a lack of awareness among young people. Many are often not sure what democracy is or even what its main institutions do. Loy9 aims to rectify this lack of knowledge ahead of local government elections in 2012 and National Assembly elections in 2013. It also aims to inspire people of all ages to believe that young people have a place in decision-making about where they live. The initiative, funded by the United Nations Development Programme (UNDP), will be on air for 18 months. The team in Cambodia have identified a need to mentor local staff to produce and develop infographics that can explain some key points to the TV and online audiences (and potentially even be produced in print later too). Any graphics we produce – would need to be understandable to an audience with low levels of education and literacy. I will be working with a young group of talented graphic designers, video editors and a squad of skilled researchers to help find out what works. how the country is divided into provinces and districts and communes. the different jobs in the Commune Council (very-local government). the structure of the Parliament. Conduct a Graphics Needs Analysis for Loy9 and produce a short, written mentoring plan. Present a session to the full production team on what infographics is and how it can be effectively used in Loy9 to inform our audience. Leave behind useful notes and resources which will allow the Loy 9 team to continue their learning in the field of infographics, and contact details for possible support via email. Well I suppose I am about to find out, I can’t wait to get started!